What is intensely frustrating writing for this blog is that – far too often – you pick up what looks like an interesting story from one of the news sources but then find it lacks the essential detail needed to put it into context or clarify the issues. Innocently, you start looking for the missing information in what should take just a few minutes and, before you know it, hours have elapsed and you are none the wiser. A simple little research job becomes a marathon. Such is the case with the latest, highly entertaining spat which looks like emerging between the EU commission and the USA over the alleged dumping of biodiesel on the European market. This we reported on earlier and, according to diverse sources, the situation has now developed to a point where European biodiesel manufacturers have filed an official complaint to the commission and are expecting it to take action through the WTO. At the heart of the dispute, as readers will recall, is the US law which applies to American biodiesel producers, which allows them to make the so-called "B99" blend which then qualify for subsidies of approximately €200 per ton. This blend, which contains as little as 0.1 percent or less of mineral diesel can then be resold in Europe as pure biodiesel, where it is again eligible for European blending subsidy schemes. According to the European Biodiesel Board (which represents 56 companies and associations, responsible for 80 percent of biofuel production in the EU), the process allows US exporters to undercut EU prices – some say by as much as 30 percent. Then, the weak dollar is adding to the US advantage. The EBB already tried this on last year (also including Argentina), when it complained that, if the distortions were allowed to continue, it could lead to the export of over half a million tons of B99 by the end of 2007. By then, according to EBB estimates, the European industry would have been producing 10.3 million tons (a figure calculated on 1 July 2007), up from 4.9 million tons in 2006, with Germany in the lead, making 4.4 million tons of the stuff. However, if we are to take theWall Street Journal at face value, EU officials and industry sources admit US producers are probably safe from any action. Under WTO rules, retaliation against dumping is allowed only if a foreign subsidy affects 25 percent of overall production. Imports of US biodiesel to Europe, it says, came to about one million tons last year, "or less than 20 percent of the total EU consumption of 6 million tons." Immediately one can see here a disparity between the EBB's projection of half a million tons, the WSJ claim of one million imports and the overall consumption figure, compared with the EBB's estimate of 10 million tons of European production. On the face of it, the European producers do not have a case but, what we do not get any sense of the current situation, which might explain why they are taking what seems to be a doomed course of action. We might get some idea if we could establish what was happening to the industry. For instance, we did report earlier that the German industry was in a state of collapse, owing to the onslaught of the US imports and as a result of changes to the German tax system, which were making biodiesel more expensive than the mineral equivalent. More recently we get some intimation that things are awry, with news that the US NTR group has lost up to €35 million "after the collapse of a German biodiesel venture, which has filed for insolvency as a result of regulatory and tax changes in that market." But, as for hard detail on what precisely is going on, this is proving elusive – to put it mildly. EBB figures stop in July last year and go no further. Anything we can find find from other sources (official or unofficial) is contradictory, out of date, or both. Clearly, there are quite serious problems in the European biodiesel industry, but the extent of those problems is unknown. The ultimate irony here is that the picture that is presented is not a healthy one – more of an industry with acute structural problems that is contracting rapidly. Yet this, along with the (supposedly) emerging ethanol industry, is at the heart of the EU's renewable fuels strategy, and absolutely essential if the EU is going to meet its 10 percent target for 2020. At the moment though, it does not look as if the EU is anywhere near being able to deliver – indicating at, as so often, we have one of those grandstanding policy initiatives (remember the Lisbon strategy?) that turns out to be empty rhetoric. 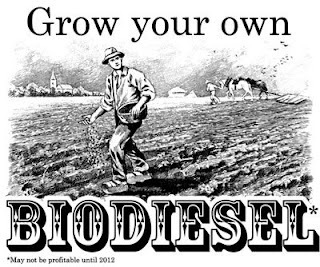 It looks like the only way we are going to get any biodiesel – as another EU policy bites the dust – is to grow our own. Three meals from a revolution? A heroic, if doomed exercise? They think they've got problems? Taking on the "army of evil"
European defence – an unrealisable dream? When is a riot not a riot?